Recent programs have expanded the connection between military service and voting rights. One key part of this system is the fast track toward citizenship accessible through military service. Both the federal government and many states have adopted policies that aim to streamline the voting process for those who served in the military in order to break down barriers. 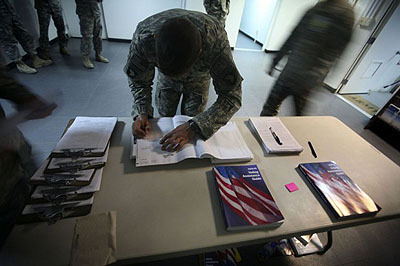 Military and overseas voters use a special process to get and return their ballot. Applications are good for all elections through December 31 of the year someone applies. Citizens overseas indefinitely (not eligible to vote in state or local elections). While there is no application deadline, a ballot can be applied for as soon as one is able, so that it is received and returned by Election Day. Applications are accepted year round. Ballots are ready at least 46 days before the election. Election officials send ballots as quickly as possible after receiving applications by mail or email. One can receive the ballot by email or mail by indicating a preference on the application. Ballots sent by mail are air-mailed to addresses outside the continental United States. A ballot will be sent to the voter by an express mail service if a prepaid envelope is provided to the county election office. A ballot must be sent back by mail or package delivery, even if election officials sent the ballot by email. A ballot won’t count if it’s received after Election Day.